They come for me in a station wagon. My mother already has me dressed in a navy-blue plaid jumper and a white blouse. She has yanked my dark hair into pigtails and now makes the sign of the cross on my forehead before turning me over to a skinny lady, who ushers me into the backseat of the station wagon. I join a small group of children, mostly Cuban, all of us dressed alike, our eyes bright and nervous. The station wagon lady drops us off at the steps of a gloomy castle in Union City, New Jersey: Holy Family Catholic School. The yard is hemmed in with black iron bars and the front doors are made of steel. Women in dress pants roam the cement grounds like fat hens with their wings clipped, their beaks pointing and gesturing. I huddle with the other children in packs of three and five like scared chicks. Mouse. It is English, a language that sounds like marbles in the mouth. It is fun to hear, but mostly because the mouse on the TV screen is flying. Sitting in the classroom, I wait for Miss Reynolds to start talking like my mother. In Spanish. Surely it won’t be long now. An hour passes. Two hours. An entire day it feels, and still it is all Mighty Mouse. I am familiar with the language. I even speak a few words of it. But I have never heard so much of it all at once. It’s like being forced to watch the same cartoon all day long. uniform and my teacher’s face. There are, however, missteps in memory, places where emotion has distorted people, sights, even cuerpos. In a school photograph, for example, my teacher is a skinny, androgynous white woman with thick glasses. But I remember her as a fat hen, a flying mouse, and kindergarten as the beginning of the end. A teacher comes for us one day. Just two of us. Me and my friend, a thin, pixie-faced girl. I don’t know why we are being taken from class, but in the darkened hallway as we find ourselves farther from our classroom, my friend starts crying, and hers are not baby tears. They are full blast, llorona wails. She roots herself to the ground and refuses to take one more step. The teacher begins dragging her by the arm, but the harder the woman pulls, the more my friend yells and twists, and for an instant, it looks as if her left arm is threatening to rip from her body, as if she will choose self-mutilation over what is to come at the hands of white women. As for myself, I don’t fight. I follow. In an empty classroom, the white woman pulls out a deck of cards with pictures and words. She spreads the cards on a broad table, one by one. The sun is pouring through the window and coating us in a yellow liquid, but I can decipher the cards. Each one holds a picture and a word: dog, cat, house. I am to repeat each word after the teacher. In Spanish, we have cartas. Tía Rosa’s husband uses them to talk with the spirit world. The cards tell us about jobs that are about to arrive, ancestors who are unhappy, a case pending with immigration. The cards are paper doors only special people can open. I look at the white woman’s cards and listen to her bold English words—dog, cat, house—and there is all the evidence of what is to come in my life. I am not to go the way of the two people I long for in the thick terror of the night. The first man I love and the first woman I adore, my father and my mother with their Spanish words, are not in these cards. The road before me is English and the next part too awful to ask aloud or even silently: What is so wrong with my parents that I am not to mimic their hands, their needs, not even their words? Before language, there is love. Before love, memory. folding the ends of the thick brown leaves. Our national language is Spanish and there are many kinds. Mostly it is the firecracker Spanish of my Cuban father and his friends. It smacks the air and the back of my head and the inside of my ears. There is also the Spanish of the Puertorriqueño Tía Rosa has married. His words mimic popcorn when it first begins popping. Finally, there is Colombian Spanish. My mother’s language does not crack or bounce. It stays close to the earth, to thick hands and the smooth sides of stones. Terrible things happen in Spanish. My father and his friend get drunk, slur their words, and turn into screeching birds. Rage is an awful habit in any language, I suppose, but on our street, in our home, in Spanish, it takes on awful proportions, and the mothers complain to each other in shorthand: “Qué se va ‘cer?” The reply is always the same: Así son los hombres. Union City is filled with virgins. La Caridad, La Altagracia, La Virgen de Chiquinquirá. They come from Cuba, the Dominican Republic, and Colombia. Like us, they are a matter of multiplicity. There is never one of anything in this world. There are many virgins, many women, many sounds in Spanish. Dollars, though, are a constant. In the kitchen, my mother folds aluminum foil over dollar bills and packs them into envelopes. The dollars are to be mailed with letters to her mother in Colombia. We send dollars because of the wars. It is the eighties and there are two wars. The one in Colombia is about land and poor people. The other one, the Cold War, means my mother and I cannot travel to Cuba. “It isn’t safe,” my father says in between puffs of his thick cigar. We travel instead to Hialeah, Florida, and Mami and I go together by plane to Bogotá and Boyacá, and by train to Queens and Manhattan. By the time I start kindergarten, I feel these places and New Jersey are part of the same country. Everyone lives within its borders, speaks Spanish, and eats a lot of fried pork. In the evening, my mother turns on the television for the noticias. The stories arrive from Latin America. Women with missing teeth cry into microphones. Men with brown faces scream. Los niños carry younger children. Sometimes, it is only the image of men’s feet in their shoes and the white sheets covering the rest of their bodies. The women wail behind the reporter, who talks about the number of dead and those left behind. “Ay, los pobres,” my mother whispers, before turning her eyes and her pregnant belly away from the television screen. But I don’t look away. I want to see what it is all about, because my mother comes from that place in the television set and so does my father. Those places where the floor is a thick brown soil and men’s bodies disappear save for their shoes. Daisy grows up as an American in a Cuban-Colombian family in the United States. In what ways does she belong to each of these three cultures? In what ways does she feel distanced from each culture? The memoir’s epigraph reads, “What does a woman inherit that tells her how to go?” How do you interpret this question and, by the book’s close, do you believe Daisy has answered it? Why or why not? 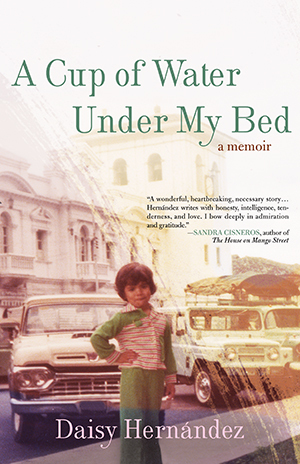 When Daisy is a young girl her mother repeatedly tells her the story of how she came to leave Colombia for America. “I am fighting to stay awake, to hear the story I know by heart, the stories I hear every night” (23). What does Daisy learn about her mother through this storytelling? In what ways are Daisy and her mother similar or different? Daisy reacts and feels differently toward the various santeras,or religious leaders, she meets throughout her life. She is initially skeptical and disdainful of Juana, whereas Yvette and Carlos bring Daisy to tears with “the solace of a woman’s words” (69). How did you feel about the “women who know”? What role do they play in their communities? In the chapter “Queer Narratives,” Daisy moves between her romantic experiences with trans individuals and the ultimately tragic story of a transgender girl, Gwen. Are there ways in which Gwen’s story parallels or contrasts with Daisy’s experience? How would this chapter differ if Gwen’s story were not included? Daisy continually likens the people in her lives to text. Conchita reminds her of an exclamation point. A boyfriend is a “prose poem.” Writing is her way of understanding her surroundings. How could everything from a genre of writing to punctuation marks help you make sense of your experiences? The policeman in the memoir’s preface says the Hernandezes’ house should be condemned. “This photograph on the wall, this pot of black beans, this radio we listen to each day, these stories you tell us—he’s saying none of this matters” (xi). This is not the last time Daisy is unfairly measured, her lifestyle misunderstood. Can you recall any moments in which you were underestimated or undervalued? How did those moments make you feel? When Daisy gets a publishing job after college, her family is proud of her success. Daisy imagines that this job will bring her the same pride and happiness, but during one meeting she realizes that “happiness is not going to come from this place or from English” (17). What do you think Daisy means by this? At what points in the memoir does Daisy attain happiness from her work? Daisy likens kissing women to “discovering a new limb” (93). What does this mean to you? Why do you think Daisy chose this metaphor? The image Daisy has of her father is elusive and shifts with time. How did it change when she discovered his religion? Does it shift at any other points in the memoir? Daisy writes, “My mother and aunties teach me that our primary ties are to women” (76) and the dedication of the memoir reads, “Para todas las hijas,” “for all of the daughters.” What are some ways in which Daisy is influenced or helped by communities of women? How do Daisy’s feelings about English as a language evolve throughout the memoir? How does English impact her interactions with her parents and tías? In her discussion of the phrase “Qué india!,” Daisy writes, “What makes racism so difficult to eradicate, not from laws but from people’s minds, is how defined it is by contradictions” (111). What do you think Daisy means by this? How is this statement supported by her experience? Each member of Daisy’s family reacts somewhat differently to her revealing she is bisexual, some in ways that are unexpected. What are some of the various reactions Daisy receives from family members regarding her sexuality? To describe Tía Dora’s silence, Daisy writes, “And it is hard, I imagine, for people who have not experienced this to understand the weight of that silence and how the absence of language can feel like a death” (86). Have you ever experienced a similar situation, if even for a period of time far shorter than Tía Dora’s silence? How did it feel? When Tía Dora invites Daisy back into her life, Daisy decides not to push Tía Dora when she expresses her disgust with two women kissing in a movie they watch together. Have you been in situations in which you disagreed with family members? Did you push back or let them be? Do you believe you made the right decision? Daisy meets a woman who responds to her Daisy’s bisexuality by asking “Why can’t I date a normal lesbian?” Can you think of other moments when Daisy’s sexuality is misunderstood? Can you identify any stereotypes or misconceptions you may hold about bisexuality? Or, if you identify as bisexual, any you have personally encountered? Daisy explores the differences between assimilation and acceptance. When she worked at the New York Times, in what ways did Daisy have to adjust or hide her costumbres or her family life and beliefs, and beliefs to appease coworkers such as Mr. Flaco? In the epilogue, “Despues,” Daisy described her mother desbaratando or letting out the stitches, a skirt. “It is what I am doing here right now, what I have been doing in all the pages before. I have the story, and I am turning it inside out, laying it down on the ironing board, taking it apart.…” In a way, the memoir is desbaratada and then rearranged. It is divided into short sections that are often arranged nonchronologically. Do you believe this works to paint a cohesive picture? Why or why not? The memoir is bookended by scenes of travel, beginning with Daisy’s trips to school and ending with her exiting a bus in San Francisco, where she begins her new life. In what ways are transitions central to the memoir? Could you identify a particularly life-changing transition in your own life?